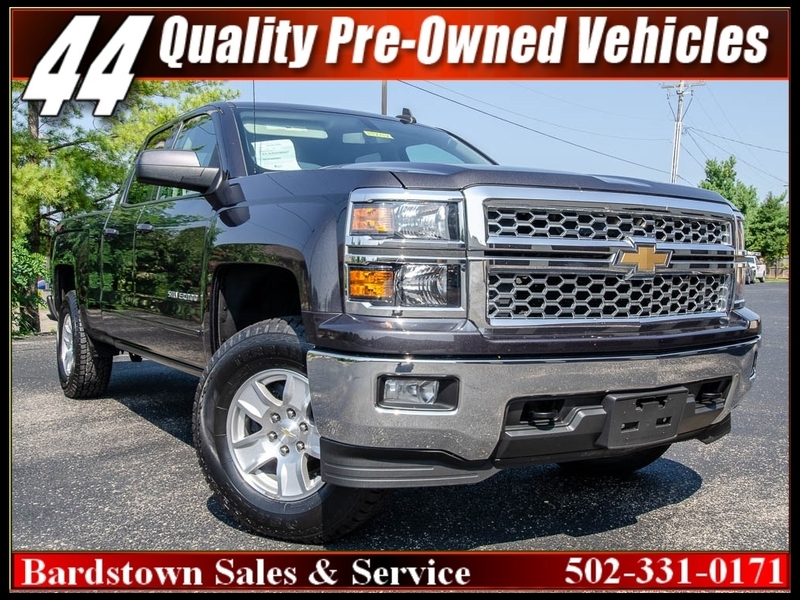 https://44automartbardstown2.comAutocheck Certified, Zero Accidents, 24 hwy mpg, 4X4, 5.3L V8, Back up Camera, Tow pkg, Usb connection, Aux music, Upgraded wheels, Keyless entry, Bed liner, FM, AM, Tires in GREAT condition, and the list goes on and on... This IMPRESSIVE 4x4 has been fully inspected by our ASE certified mechanics as well as detailed from top to bottom and inside & out. Work or play this 4x4 will get the job done in style & comfort while MAKING THE STATEMENT you have been dreaming of. You will turn every head from the job site to the boat dock when this BAD BOY cruises by. 44 Auto Mart also has FULL ACCESS to the nations leading banks & credit unions so we are confident you will ALWAYS get the absolute best payment options. So plan that trip across the country or just across town and remember you ALWAYS SAVE MORE @44 ~~` A+ BBB ~~ 4X4 HEADQUARTERS ~~ LOW PAYMENTS ~~ TONS OF BANKS ~~ CALL OR TEXT ~~ BACK UP CAMER ~ 5.3L V8 ~ 24 MPG ~ WORK HARD ~ PLAY HARD ~ CALL OUR BARDSTOWN LOCATION 502-331-0171 FOR DETAILS!! Get the feel of this one as it won't be around long! Hurry it is priced to sell fast!! Be sure to ask about our excellent Finance Options! We use a ton of lenders, banks and credit unions and offer low interest rates and payment plans! Come see us today and find out how easy it is to SAVE MORE AT 44! WE ARE A FAMILY OWNED AND OPERATED DEALERSHIP WHO HAS BEEN IN BUSINESS SINCE 1988. WE CURRENTLY HAVE OVER 300 QUALITY PRE-OWNED CARS & TRUCKS! IF WE DON'T HAVE IT, WE WILL LOCATE IT FOR YOU! SEE OUR ENTIRE INVENTORY AND INVENTORY DISCLAIMER AT www.44automart.com CALL OUR BARDSTOWN STORE 502-331-0171FOR MORE DETAILS..